"Standalone Universal Windows Platform Holographic Emulation is the next step in holographic emulation, extending its functionality outside of the Unity Editor," wrote Unity's Lukasz Pasek in a blog post. By tapping into the computing power of a PC, HoloLens users can render complex 3D content, dense point clouds, and big CAD models that are much more complex than the HoloLens can handle via its CPU and GPU while still using all its sensor data in real time. One caveat to this approach is that a robust wifi network is required. 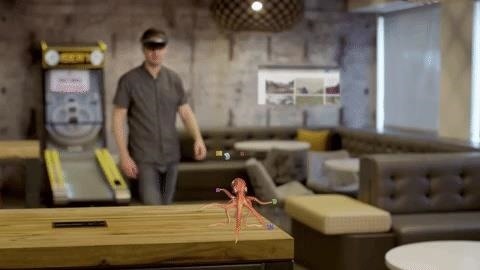 While this method has been possible in Unity before for faster development cycles, this new method enables developers to package the content in an app, install it on a PC, and view the content on HoloLens through the Holographic Remoting Player app. Comparing the capabilities of the HoloLens to the Meta 2 is typically uneven considering that the former is wireless and the latter has a wired connection to a PC and, in turn, can tap into more processing power. This wireless tethering could even the processing-power playing field in some cases since HoloLens users now have the option of siphoning the horsepower of their PC to run more intensive applications. Prerequisites for playing with Standalone UWP Holographic Emulation include Unity 2018.2 beta and Windows 10 Anniversary Update or later. Pasek details the steps for getting started at the Unity blog.